This volume strengthens the case for analysing discourse from the point of view of discourse participants’ accountability and responsibility. It adds an important and largely neglected strand to research in discourse studies and pragmatics by analysing the expression and attribution of responsibility, particularly in professional discourse. Debates on social and professional responsibility have proliferated in recent years both in the public sphere (e.g. in connection with corporate responsibility reports) and in more local practices (e.g. as manifested in the publication of in-house codes of conduct). However, there is little academic research on professional discourse which systematically addresses the ways in which responsibility relations are construed in language use. This volume contains a number of case studies focusing on different professional settings: media, health care and social work. The types of data examined range from globally available mass-consumed discourse (such as news agency dispatches) to local and essentially private face-to-face encounters (such as counselling sessions). The studies examine different linguistic features (such as reported speech in written texts and backchannelling in spoken encounters) and different types of meanings (such as agency and causality). The studies draw on different methodological approaches (mainly pragmatics, conversation analysis and (critical) discourse analysis). A common thread running through the contributions is that responsibility is not a stable quality of people or institutions, but a dynamic and variable resource that language users negotiate in interaction. Given its exploratory nature, this collection is successful in highlighting the theoretical as well as methodological implications of analysing responsibility in situated interactions that take place in professional settings. The work is therefore an excellent reference, directing readers (particularly researchers and professional practitioners in language studies and other fields) to approach professional discourse from the perspective of responsibility. Although the articles vary slightly in their respective treatment of responsibility in discourse, the volume as a whole provides a rich inter-disciplinary, and multi-cultural description of the topic. 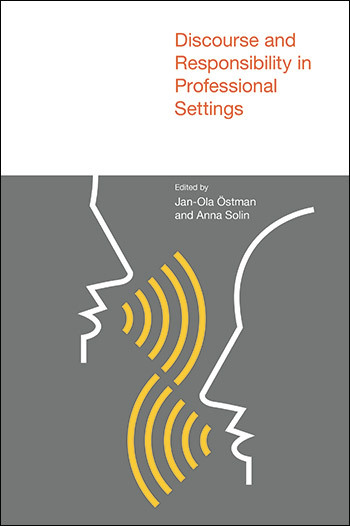 This book represents a welcome advance in theoretical sociolinguistic analysis in professional workplaces. Its focus on responsibility in the professions is timely and important considering the reductionist attention to individual responsibility undergirding dominant political discourses and the widespread codification of professional responsibility in workplaces. Whereas there has been ample critical analysis of these developments in academia, there is a clear need for further investigation of their enactment in practice. Current well-established theoretical perspectives on discursively constructed identities and positioning underpin this publication, extending the work of other research in this broader area. Its strengths lie in the contributing authors’ careful unpacking of responsibility as it is enacted dynamically across contexts in multiple workplaces. Their analyses will resonate strongly with readers’ own knowledge of professional workplaces across many sectors.